The typical rainfall patterns are inverted this month some of the top itineraries to the Pacific resort areas get washed out. It’s the perfect time of year to get a bit off the beaten path and head to the east coast. 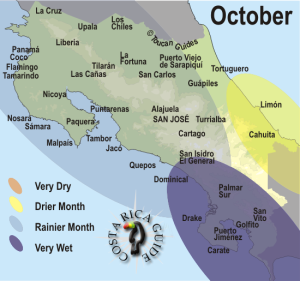 October is the rainiest month on the Pacific but driest on the Caribbean. Days and even weeks of rain can be generated on the west coast and over the central mountains by the westerly winds called temporales del Pacífico. Many lodges and tours on the Osa and southern coast shut down operations. October may be the rainiest month but the Costa Rica Time Machine can find the driest destinations. Even the traditionally dry Guanacaste region has some rain most days and the unimproved roads of the Nicoya peninsula become impassable when the rivers rise and flood the fords. On the other hand the Caribbean is basking in the driest and sunniest weather of the year. The mountains scrape the moisture out of the Pacific air and by the time it reaches the coast it’s just a warm wind. Temperatures across the country are about as low as they ever get which means averages around 80 °F (27 °C) with lows overnight about 68 to 76 °F (20-24 °C). Up in elevation by San José temperatures average 75 to 85 °F (24-29 °C) during the day. If you go even higher by Irazú Volcano or the cloud forests of the San Gerardos it even gets “cold” (52-66 °F and 11-19 °C). The rainy season came in with a vengeance in October of 2017 as the low pressure system from tropical storm Nate in the Caribbean pulled warm moist air from the Pacific across the central mountains producing record rainfall, flooding and damage on the western side and Costa Rica’s costliest natural disaster ever. It continued wetter than normal well into January 2018. 2019 is likely to be a wild ride in October since there is no El Niño stabilizing and drying pattern predicted. In general “green season” (rainy season) travel is gaining popularity in Costa Rica, but it’s unlikely any except the most popular hotels will be fully booked. If you want the flexibility of traveling without a fixed itinerary or reservations October can be a good choice (as long as you don’t want to go to Drake, Corcovado, Golfito, and/or Zancudo). If you do decide to travel to the southwest and Osa peninsula check to make sure that the hotels and lodges you’re interested in are actually open and accessible. The drier weather in the southern Caribbean this time of year makes it a relatively undiscovered rainy season bargain but word is getting out quickly and if you have your heart set on a particular hotel you should probably have reservations. Lower numbers of travelers mean lower prices and most places on the Pacific side offer discounts of 20-40% throughout October. On the Caribbean October is the high season so discounts are generally not available. If you still think October travel is right for you check out the rainy season tips on activites and wildlife watching. October 2019 looks likely to be La Nada ENSO (El Niño Southern Oscillation – Neutral) which means it’s particularly unpredictable weather. So far it looks like it’s going to be wet on the Pacific side. Carnavales de Limón was cancelled for several years due to lack of funding. In 2017 it was revived in January, cancelled in May, resurrected in July and then postponed due to Tropical storm Nate. The Caribbean did not suffer major damage but the roads in and out were closed and Carnival was celebrated Oct 14 through 22, 2017 with the Great Parade on Sat Oct 21. There is currently no reliable information about the Carnival schedule for 2019 or indeed if there will be one. approximate exchange rate ¢617 per $U.S. Founding Day – A week of local celebrations in San Isidro de El General including street fairs and fiestas, dancing and sporting events culminates in the fiesta marking the founding of the town. Día de la Raza – Columbus day commemerates the arrival of Columbus in the new world and caps off several days of Carnival on the Caribbean coast.